Note from the LeftEast editors: this article was originally published by the Balkan web-portal Bilten.org. On August 25th, in Brussels, Kosovo’s Prime Minister, Isa Mustafa and his Serbian counterpart, Aleksandar Vucic, signed the Agreement on the Association of Serb majority municipalities in Kosovo. This was the flash point and most disputable event of the three year negotiation process between Kosovo’s government and Serbia’s government. From the moment that it was made public, there was the conception that we will now have a political entity that is based on the national division of the country. But what does August 25th‘s agreement contain on the Association? On paper, the Agreement’s text aims to strengthen local democracy, to develop local economy, to control local education and to improve primary and secondary health and social care. It also claims to coordinate local urban and rural planning, to improve local living conditions for returnees to Kosovo, and so on. According to the agreement, the Association is going to have an Assembly as a legislative body, a President and a Vice President, a Council as a guidance and consultative body, the Board as the leading body and its Administration. The August 25th agreement arranges that the Association will work with state institutions on the basis of reciprocal cooperation (Point 8). According to Point 16 of the Mustafa-Vucic agreement, the Association could be financed by central authorities, but also from donations and grants from the Republic of Serbia or international organizations, but it wouldn’t be obliged to pay taxes. Point 20 of the agreement of August 25th recognizes the Association’s right to have its flag and coat of arms, meanwhile final provisions foresee the approval of the Statute of Association. “There is white smoke, we have the agreement!” This was the way Vlora Çitaku (at the time a European Integration minister from Thaçi’s Democratic Party, nowadays Kosovo’s ambassador to the U.S.) considered the agreement on Twitter. She tweeted these words on April 19th 2013, just as the prime ministers of Kosovo and Serbia, at that time Hashim Thaçi and Ivica Dacic, had signed the famous agreement, which had been the culmination of the so-called “technical dialogue” between the two governments. But, her “à la Conclave” post with fumata bianca turned out to be ghastly. Usually, the smoke is seen after the fire. But, in our case, in a perverse way, the “fire” came after the “smoke”. 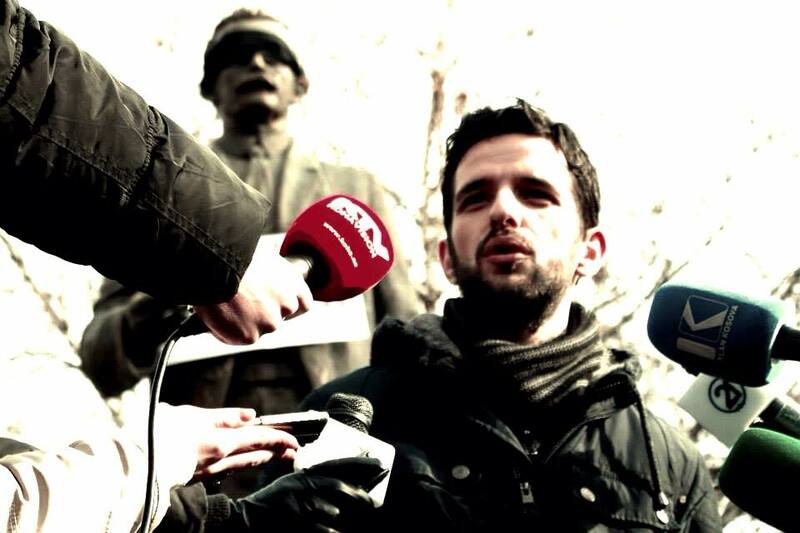 Following the agreement of April 2013, protests broke out led by the “Vetevendosje!” (Self-Determination!) Movement, which were frequently escalated by wild violence from the police. But, what was the content of this agreement? This is important for the reader, because in actuality, the agreement of August 25th 2015 between Mustafa and Vucic is based on the agreement of April 19th 2013 between Thaçi and Dacic. On Point 1 of the agreement of April 19th 2013 the creation of the Association of Serb majority municipalities in Kosovo is predicted. Point 2 declared that the Association is going to have its Statute; point 3 declared the structure and organogram of the Association, while Point 9 recognized the right of the Serb majority municipalities of Northern Kosovo to have an exclusive Police commander – who could only be Serbian. Thus, as a consequence of the Thaçi-Dacic agreement of 2013, we have the present-day agreement of two new prime ministers, Mustafa and Vucic. Their vice prime ministers, as luck would have it are ex-prime ministers, Thaçi and Dacic. The agreement on August 25th between Mustafa and Vucic was met with a huge resistance from the opposition in Kosovo. They are harshly criticizing the government and are accusing them of national treason. On the other side, the Government is claiming that there is no national treason, no encroachment or invasion of the integrity and sovereignty of Kosovo, nor is there a “Trojan horse” inside the territory of Kosovo. Prime minister Isa Mustafa, vice Prime minister (and the leader of the main political party), Hashim Thaçi, as well as the Foreign Ministry, officials of the government and of the coalition’s parties more generally have been insisting for two months that the agreement on August 25th will empower the territorial integrity of Kosovo. They claim it will consolidate the application of the laws of the Republic of Kosovo into the municipalities with a Serb majority. Prime Minister Mustafa has said that this agreement indirectly precipitates the recognition of Kosovo’s independence from the Serbian government. Regarding the competences and the functions of the Association, he has said that everything is framed within the laws and the constitution of the Republic of Kosovo. But, on the other side, there is an absolutely different interpretation regarding the Association from the opposition, especially from the main opposition party, “Vetevendosje!”, which is a self declared social democratic party. “Vetevendosje!” claims that through the agreement of August 25th the “Bosnification of Kosovo” is going to happen. They draw parallels with the “Association of Serbian municipalities of Bosnia” founded on April 1991, which on September 1991 declared autonomy, on January 1992 declared independence and on December 1995 it was de jure recognized as “Republika Srpska” in the Dayton Agreement. Party leader Albin Kurti and other representatives from Vetevendosje! 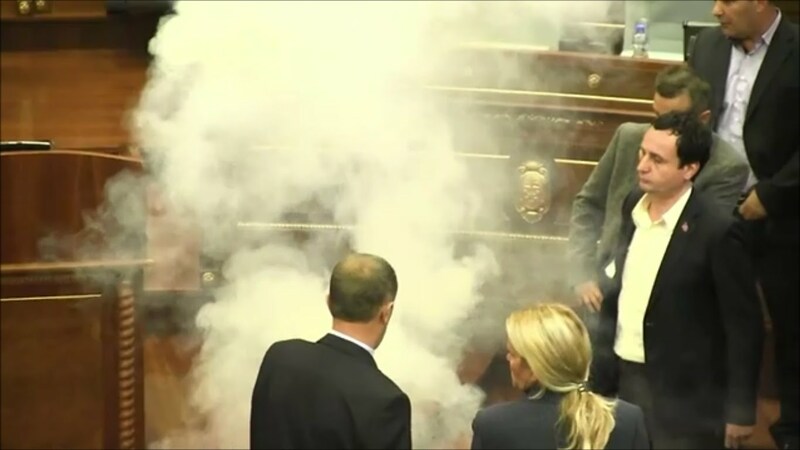 release tear gas in the Kosovo parliament in protest at the Association. According to “Vetevendosje!”, the Association would have separate institutions from the state of Kosovo: separate Assembly, Police, Judiciary, Budget, Education and Health System. Also, they claim that the Association will have total control on a lot of important resources. Included are the biggest dam (Ujman/Gazivoda lake), the Trepca mines and some other smaller mines in Central Kosovo and the famous winter tourist center of Brezovica. For almost all of the past two months since the agreement, there has not been a single week that activists of “Vetevendosje!” have not organized a symbolic action or a protest against the Government, the majority of which have ended with physical confrontation with the police forces. This party’s activists in some cases have attacked Prime Minister Mustafa himself with eggs and succeeded in blocking two sessions of the Parliament where Mustafa was supposed to report on the agreement. The first session was stopped because the deputies of the opposition attacked the Prime Minister with eggs as soon as he began reporting on it. The second session was blocked because the deputies of the opposition blew whistles and jeered during the whole time. Albin Kurti himself, the founder and ex-president of “Vetevendosje!” unleashed a tear gas attack on the coalition party’s deputies. Following these events on the evening of October 12th the police arrested him. His arrest gathered a group of activists from the opposition, a majority of which were activists from “Vetevendosje!”. They attacked the police headquarters, breaking windows, throwing stones and Molotov cocktails. The riot police responded to this with arrests and unrivaled violence. Besides “Vetevendosje!”, the Association is opposed by two other opposition parties, AAK (Alliance for the Future of Kosovo), the head of which is Ramush Haradinaj and “Nisma” (The Initiative for Kosovo), the head of which is Fatmir Limaj, both of them ex-KLA commanders. Their arguments against the Association echo those of “Vetevendosje!”: national treason, the Bosnification of Kosovo, interference from Serbia, etc. Furthermore, Haradinaj’s AAK claims that not only is the Association dangerous for Kosovo, but that the Thaçi–Mustafa coalition through the border agreement with Montenegro, “is giving away” ten thousand hectares of Western Kosovo’s mountains. A few days ago, the Austrian newspaper “Der Standard” carried an article about the political situation in Kosovo highlighting the objection to the Association by the opposition’s side. They reported that the Association is being opposed from the nationalist opposition of “Vetevendosje!”, AAK and “Nisma”. According to this newspaper, there are a large number of KLA ex-commanders that are in the opposition parties. They declare that their problem is the Special Tribunal, established several months ago, which can accuse them of war crimes. A year ago, the most respected newspaper in Kosovo, “Koha Ditore”, published secret documents from NATO services. These documents showed an organizational chart of criminal structures in Kosovo which included not only an absolute majority of Thaçi’s PDK members, but also implicated the involvement of leading members of the opposition; Ramush Haradinaj and his brother, Daut (AAK), Fatmir Limaj (Nisma), Rexhep Selimi (Vetevendosje), etc. Until the summer of 2014, “Vetevendosje!” was categorically against AAK and Nisma. They actively accused them of racketeering, criminal activity and corruption, stating that they do not differ from Thaçi’s PDK. With the initiation of their cooperation, “Vetevendosje!” has not once publicly accused them of such crimes again. Aside from the impaired, unsatisfactory political parties, there is another political organization in Kosovo, which is trying to subvert the ideological hegemony through a thorough leftist critique, opposing the Agreement’s ethnocentric project not with an alternative ethnocentric discourse, but rather with a leftist one. The Students’ Political Club (KPS) – which is only dubbed a student organization, although they have radically protested against corruption, the central (private) electricity company and other social problems – has managed to articulate a different critique against the Association. The “Pronto” scandal: Wire-tapping ..
*At the time of writing this article, pro government mainstream media has warned that the opposition is provoking “bloody protests” on October 15th, on the day when Prime Minister Mustafa will try for the third time to give the report on August 25th‘s agreement with Vucic. Fitim Salihu is the founder of the Students’ Political Club. He finished BA studies in Political Sciences at the University of Prishtina. He regularly analyses and writes about international relations, especially about Latin America and the Middle East. He had also worked as editor of the culture section at a daily newspaper in Kosovo.